At OARS we believe we owe it to those who came before us, to ourselves, and to future generations to ensure that wild and uniquely American landscapes like Desolation Canyon remain safeguarded now and forever—and accessible to all. Desolation Canyon remains one of the most remote areas in the lower 48. Located in Eastern Utah, this rugged canyon has been carved for millennia by the Green River and is a popular destination for intrepid river runners who are eager to tackle the 83 miles of Class II-III rapids between Sand Wash and Swasey's Boat Ramp. For centuries this remote canyon was home to numerous Native American communities who left their mark on the landscape through pictographs and petroglyphs that date back thousands of years. 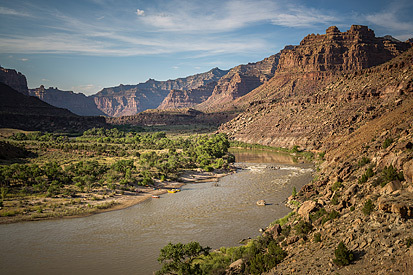 At its deepest point, the Green River is more than 5,000 feet below the rim of Desolation Canyon—making it deeper than the Grand Canyon for a short distance. Today, Desolation Canyon is seeing an increased threat from encroaching oil and gas development in the Uinta Basin and many in the outdoor community are working to ensure the protection of this American gem. Vernal, Utah is an amiable community steeped in Wild West history at the base of the Uinta Mountains in northeastern Utah. In 1948 Vernal had its first oil boom and from that time on it has been a boom and bust town. Most people who decide to stay in Vernal eventually take jobs in the oil fields south of town. Vernal's remote location provides an amazing opportunity for recreation with the Uintas to the north and Book Cliffs to the south. It is the gateway to Dinosaur National Monument and the birthplace of commercial river running. Garrett Eaton was born in Vernal to an oil and gas family. His father's job took them all over the world before resettling in Vernal where Garrett now lives with his wife Zinna and their four kids. Zinna's family are descendents of some of the earliest settlers of the Uinta Basin who in 1929, ran the first commercial river trip in the U.S. on the Green River outside of Vernal. Garrett left high school at the age of 16 to work in the oil fields where—apart from his time in the Marine Corps—he has worked most of his life. Recently, he started dividing his time between the oil fields of North Dakota and working as a rafting guide on the rivers near his home. Zinna works for the Vernal Public Schools as a special education teacher working with children of varying degrees of learning disabilities. Together they are raising their kids with an emphasis on spending as much time outside as possible. Filmmaker Justin Clifton has dedicated his career to telling the stories of people and place, with an emphasis close to his home in the American Southwest. He creates sincere and intimate portraits of humans who are shaped by, and inextricably linked to, the natural environments that surround them. Weaving beautiful cinematography and rich emotional depth, Clifton’s films are an ode to the raw, natural beauty of this rugged landscape and the people who fight the environmental and social justice battles being waged across the region. He most recently directed Leche y Miel (Milk and Honey), a story of the people of Yuma, Arizona and their connection to the Colorado River, America's Most Endangered River. At OARS we strive to enrich people’s lives by providing outstanding outdoor adventure experiences. We personally encourage and actively support awareness, deeper appreciation, and preservation of our rivers and natural ecosystems. Our trips are active adventures that emphasize heightened attentiveness to human impact on the environment. In partnership with our guests, OARS has contributed more than $5 million in donations and fees toward the preservation of the environment and to various conservation initiatives since the company was founded in 1969. Angels Camp, Calif. — Today, OARS is pleased to announce the premiere of Return from Desolation, a new short film about a war-veteran-turned-river-guide’s fight for redemption and balance through the wild rivers and public lands within Utah’s Desolation Canyon. The film, from award-winning director Justin Clifton, and supported by YETI, Chaco, NRS, and Sierra Club, will premiere at the 2018 Wild and Scenic Film Festival in Nevada City, California on January 13. After its premiere at Wild and Scenic Film Festival this month, Return from Desolation will screen at festivals across the country and OARS expects to release the film online in early June.